WASHINGTON, DC, December 21, 2010 (ENS) – The nonprofit Center for Biological Diversity today filed notice of intent to sue the Department of the Interior for failing to write a recovery plan for wolves in the lower 48 states. In July the Center submitted a scientific petition to Interior’s Fish and Wildlife Service asking that a national recovery plan be developed, but never received a response. “Wolves are an integral part of this county’s natural history and need a national recovery plan now,” said Noah Greenwald, endangered species director at the Center. Once widespread throughout North America, gray wolves now number about 5,000 in the lower 48 states, inhabiting the northern Rockies and northern Great Lakes regions. Greenwald says a national plan would provide a roadmap for recovering existing wolf populations and returning wolves to some of their historic range around the country. Suitable wolf habitat exists in the Pacific Northwest, California, Great Basin, southern Rocky Mountains, Great Plains and New England. Such a plan is required by the Endangered Species Act, says Greenwald, and according to today’s notice of intent to sue should have been developed 30 years ago. 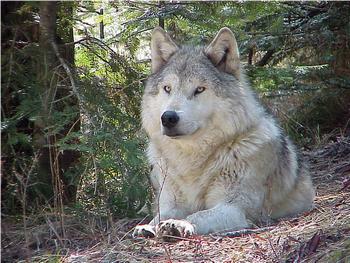 In March 2009, Secretary Salazar approved removal of wolves from the Endangered Species List. Idaho and Montana scheduled hunting seasons, and 350 wolves, nearly 20 percent of the total population in both states, were killed. A coalition of 13 groups seeking to put wolves back on the Endangered Species list challenged Salazar’s wolf delisting decision. A federal court in Montana overturned Salazar’s decision August 5. Federal District Judge Donald Molloy ruled that wolf populations must be managed as a whole, and not by arbitrary political boundaries. That means the Idaho Fish and Game agency will no longer perform statewide monitoring of wolves, conduct investigations into “allegedly illegal” killings of wolves, provide law enforcement in response to “allegedly illegal” takings of wolves, or implement the livestock depredation response program, Governor Otter said. Instead, the Idaho Fish and Game Commission has refocused its efforts on protecting Idaho’s deer, elk and moose, and the Department of Fish and Game will apply to the Interior Department for additional flexibility in addressing wolf depredation issues so Idaho can exercise its “sovereign right to protect our wildlife,” said the governor. With the August federal court decision that reinstated Endangered Species Act protection for wolves in the Northern Rocky Mountains, federal law now guides Montana’s management of the state’s wolf population. As a result of the decision, which Montana has appealed, the line that once divided Montana’s wolf population as a “nonessential experimental” population in the southern half of the state, and an “endangered” population to the north, has been reinstated by the court. Different federal regulations apply in the two areas. In the mid 1990s, to hasten the overall pace of wolf recovery in the Northern Rockies, more than 60 wolves were released into Yellowstone National Park and central Idaho. The minimum recovery goal for wolves in the northern Rocky Mountains was set at a minimum of 30 breeding pairs and a minimum of 300 individual wolves for at least three consecutive years. This goal was achieved in 2002, and the wolf population has increased every year since. Another federal judge ruled in November that the U.S. Fish and Wildlife Service was not justified in rejecting Wyoming’s wolf management plan. U.S. District Judge Alan Johnson ruled that the federal agency’s insistence that Wyoming list wolves as a protected “trophy game” species throughout the state was “arbitrary and capricious” and should be set aside. Judge Johnson directed the federal agency to revisit whether Wyoming’s proposed trophy game management area in the state’s northwest corner is adequate to maintain a healthy wolf population, or whether the state’s proposed boundaries should be expanded. The state’s plan would allow unregulated killing of wolves in all but the northwest corner of the state. Currently, all of Wyoming’s wolves are listed as a federally endangered species, so it is illegal to kill wolves anywhere in the state. Last year at this time, the wolf population in the Northern Rocky Mountain Recovery Area, which encompasses parts of Montana, Idaho, and Wyoming, was estimated to be at least 1,706, with 242 packs, and 115 breeding pairs. About 525 wolves were estimated to inhabit Montana, in 100 packs and 34 breeding pairs. Nevertheless, the nonprofit Republicans for Environmental Protection said Thursday that it is too early to remove the gray wolf from the Endangered Species List. With that, Greenwald of the Center for Biological Diversity agrees. Wolves are a keystone species that benefit prey populations by culling sick animals and preventing overpopulation, he points out. Studies of wolves reintroduced to Yellowstone National Park show that they also benefit other species, including pronghorn antelope and foxes by controlling coyote populations, and songbirds and beavers by dispersing browsing elk and allowing recovery of streamside vegetation.